A “Laxy- Responsive Coming Soon Template” is perfect if you like a clean and minimalistic design. The pack allows you to use 6 different type of pages: static background, slideshow , animated slideshow , video background (YouTube) , video background (HTML 5) , and background with “live wallpaper ” effect . This template has the support of the change content using touch and swipe. 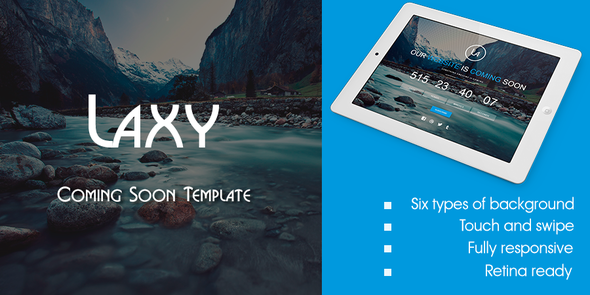 Item Reviewed: Laxy - Responsive Coming Soon Template 9 out of 10 based on 10 ratings. 9 user reviews.